These lovelies from Scarpasa were waiting for me when I got home from work yesterday. I took them out for a spin almost immediately by walking to dinner. Not only are they pretty as can be, but they're comfortable, too! Great shoes! I love the color, bow and height . . . perfect! Super cute! And I love the yellow background. They are beautiful, I love your necklace. Oh too cute! What brand are they? Those shoes are amAAAAAAAzing! The color, the heel, everything. Perfectly paired with the jeans and top, too. Gorgeous shoes. I love all the colors in the first photo! I have shoe envy - I'm in love with those! Sooo pretty! I like how you paired it with an oversized sweater, cropped skinnies, and statement necklace! Your top is so amazing. Those Zinda shoes are adorable! Not sure I could pull off the bow but I love how you styled the outfit. Very cute. amazing sandals, love their color! pink power! Those shoes. Amazing! I love the necklace and the sweater too. Great outfit. those shoes are so cute and they are the perfect height for work! You can tell those shoes are so supple. And the wood grain heel is killing me. wow! this is a fave! love the shoes, they are just gorgeous. i wish my jeans fit as well on me, i have jean envy haha!!!! 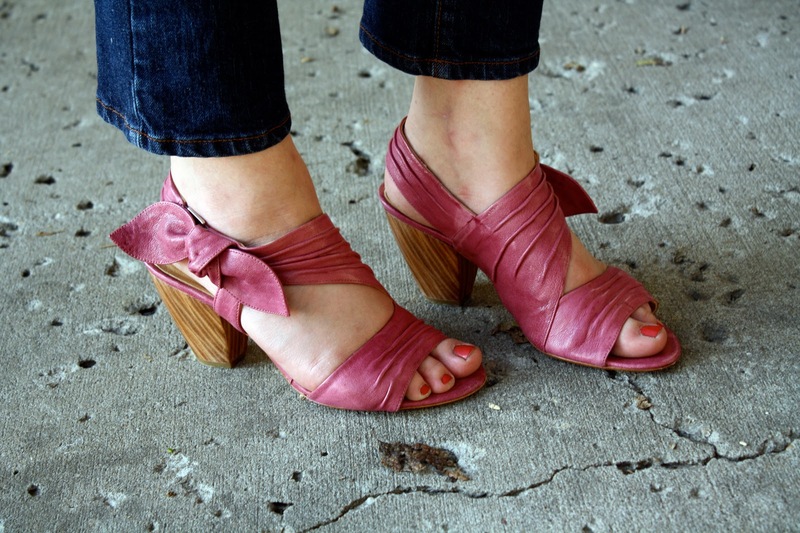 i love the wooden heel! I love your shoes they are too cute!!! Cute! I love them with your ankle-length jeans. Great that they're comfortable as well. i'll repeat what everyone is saying.. those shoes are amazing! I love this look! 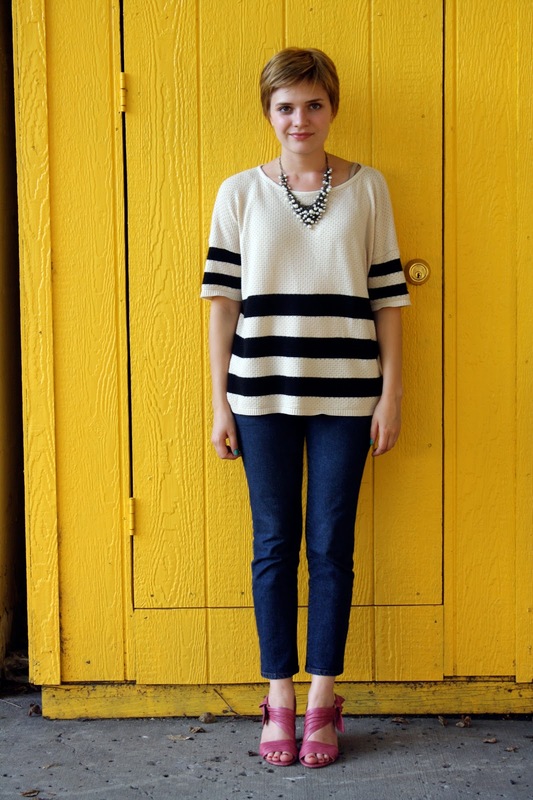 You can never go wrong with stripes and the shoes are adorable - nice pop of color! I love the wooden heel on those, and they look great paired with that striped shirt!